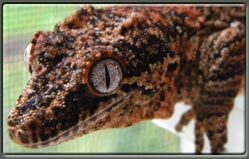 Correlophus ciliatus are native to forests of Southern Grande Terre and at least one small surrounding island (Isle of Pines). They were thought to be extinct until their rediscovery in the 1990s. 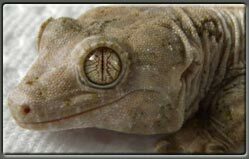 Crested Geckos are a medium sized stocky gecko species with a large head relative to body size. 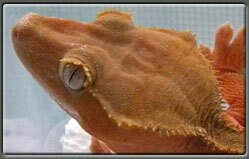 The Crested Gecko gets its name from the crests that run along its brow line and down its back. They tend to spend most of their time in small trees and low shrubs but can also be found in treetops over 50 feet. They will, however, seek out hiding places near the ground to sleep during the day. 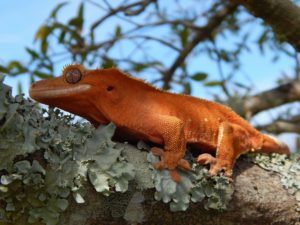 Crested Geckos feed on both insects and fruits and in most cases thrive at a temperature range of 65 – 82°F, with a relative humidity between 50 and 80 percent. Average adult length, including the tail, is about 9 inches. Minimum enclosure size for a single animal should be around 20 gallons (16″ x 12″ x 24″); 30 gallons (18″ x 18″ x 24″) for an adult pair.